Sofa Fabric | Sofa Fabric Estimator | Sofa Fabric Calculator | How Much Fabric to Cover a Sofa? How much fabric will I need to recover a sofa or chair? This guide gives a general idea of how much fabric is needed to recover a sofa or chair. A small or medium sized high-back chair will, typically, require about 6-7 metres. A single lounge chair - part of a suite for instance - will need about 8-9 metres. A two seater sofa will typically need 14 metres. A three seater will generally require 16 metres and a four seater 18 metres. 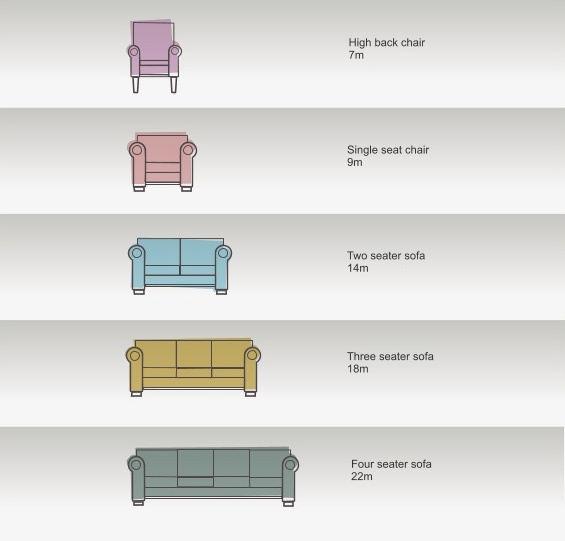 The lengths suggested are based on average sized chairs and sofas and the use of plain fabric. If you are using a patterned fabric you will require about 10-20% more, depending on the pattern repeat. If you can determine where the joins are in the fabric based on your existing sofa, then add on the vertical pattern repeat for each join. To get a more accurate figure measure each surface of the sofa which requires fabric and add these areas together, then add on 10-15% as a margin of error. It is best to begin with the outside back, then the inside back, then the outside of the arms, then the inside of the arms. Then add on the gussett and the area of each surface of every cushion. In short, simply split your sofa surface up into as many small rectangles as is necessary, calculate the area of each, add these up and then add on 15% more as a safety margin. If you are still unsure please feel free to send us an email (info@loome.co.uk) with a photograph or two of your project, specifying which fabric(s) you had in mind to use, and we will give you our best opinion of the length required. Our general advice is to order a bit more than you think you will need - any fabric left over can be used to make spare cushions, arm covers, or throws, or simply kept for future use. Please note that, through our fabric estimator or email advice, we are only giving estimates and Loome Ltd cannot guarantee specific measurements.